Find your local Chapter on our Chapter Map and get in touch to learn more about projects going on near you! No local Chapter? Don’t worry- we’re always looking for new Chapters representing local youth of diverse faiths and genders! Contact us for more info, or with other project ideas. Any money you can give makes a big impact. 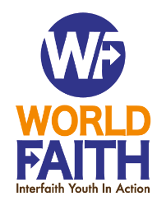 Please consider donating to World Faith, and feel free to contact us for more donor opportunities. Follow us on Twitter, Facebook, and keep up with the World Faith blog! Also consider joining the World Faith newsletter.